Police in-service training started back up again and I am excited to get back to teaching. During the summer months I have been working on developing my facilitation skills and spent some time researching, studying and developing the art of Socratic questioning in an effort to foster officer engagement in the programs of instruction I teach. My hope is to make the classes and case studies a bit more interesting while developing cops depth of understanding so they can take what they learn and apply it to the streets safely and effectively. "Learning philosophy seeks to merge the benefits of learning to include training, education, experience and self-learning. This learning philosophy will help to create thinking individuals and organizations that can solve problems under stress based on an understanding of the problem. It stresses the development of intangible attributes such as initiative, critical thinking, judgement, and responsibility." There are no magic bullets, no panaceas, no school solutions to even teaching. If we want to improve the decision-making, adaptability and other core skills, (sense-making, problem solving, meta-cognition and attention control) then we must change the way police learn from the current approach which is inward thinking process-focused, primarily based on “competency theory” of learning, first adapted by public schools back at the turn of the 20th century to a new approach, which is outward, effect/outcome-focused) more aligned with the outcomes we are seeking. How we train and develop others, has to focus on a learning philosophy that seeks to merge the benefits of training and education with self-learning and experience. The learning philosophy helps create thinking police officers that can solve problems under stress based on an understanding of the problem. The outcomes teachers should seek is to improve your ability to learn. In my experience it is a hybrid of teaching methods that best develop others and active involvement is key. Socratic discussion, is just another tool in the facilitators toolbox that helps us unlock the linear one way thinking when it comes to training and development, seen all to often in policing. I use it in combination with tactical decision games (table tops, roll play, force on force exercises, after action reviews, and case studies) to get the mental juices flowing within those participating and it works because it gets their minds thinking and probing beyond what they have been told. Over the years we have written and talked about the adaptive leader methodology and using more tools to develop effective decision makers, in policing. 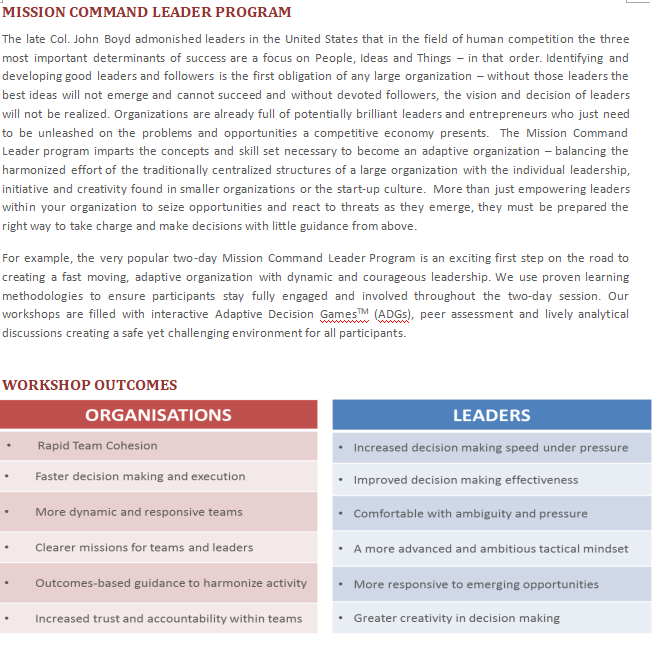 The adaptive leader methodology has evolved over the years and is today know as Mission Command. These leadership methodologies are really about innovative ways to teach and develop your people so that the mission and intent of your organization is carried out. Learning to facilitate really is raising the bar of professional police development. Teaching takes effort and that effort includes continually learning, unlearning and relearning. That status quo does not cut it when it comes to developing people who are required to make life altering decisions. Your teaching efforts must enable an officer the ability to frame and solve problems as well as explain, defend and modify or adapt courses of action. I have been working with, and learning from Don Vandergriff, for well over a decade. He has evolved the adaptive leadership concepts and ideas through research, study and experience into the Mission Command Leader Program, which is all about experiential learning and teaching through facilitation. Facilitation as a tool to teach, takes its form in tactical decision games, after action reviews, case studies, critical or Socratic questions and other problem solving tools that foster student officer engagement and learning, to develop their speed and maturity of decision making, while at the same time developing a gung ho, working together culture that is focused on lifelong learning while reaching successful outcomes in the most extreme conditions. Making the programs of instruction of greater value to the street cop goes way beyond lecturing. The methodologies used by students who are learning via facilitation differ from those in other police training settings. The students will prepare for and participate, in discussions, develop course of actions and then critique and defend individual and group exercises. The Adaptive Course Methodology described above is rooted in Outcomes Based Training and Education is the way or methodology used to develop people to succeed in a culture of Mission Command. Police facilitators, (teachers, instructors, trainers, educators) must first learn, how we learn, before they can teach others. The focus of effort is to cultivate some deeper thinking and learning through discussions, experiential learning that requires we question what we do and why we do it. This means we have to critically think and go beyond school solutions and best practices. This will be where Socratic discussions become so important as they examine each scenario. As they look at cases they will being asking themselves simple yet critical questions: What is going on here and what do I do about it? This ultimately leads to other questions such as: What is my mission and intent? What are my capabilities? What immediate outcomes do I (we) seek? What obstacles do we face? What resources do we have? Do I (we) need to take immediate action or can we (I) delay? What's the greatest danger Innocents face? What's the greatest danger of risk I (we) face? What opportunities can I (we) leverage to gain the advantage? Is my course of action sound? What are the consequences or possible unintended consequences of my course of action? Is my course of action simple? Is my course of action legal, ethical and within guidelines? If my course of action fails can I adapt a new course effectively? Ho will our adversaries react? How will the uncommitted (community) react? These are just a few examples and each case will bring up its own unique questions. The idea is to take us beyond being told what to do and to critically think about the scenario. Police training is all too often comprised of, rote lecture based on PowerPoint slides, which often leads to a mechanical, check the box feel towards solutions. There is often little depth in understanding, why we do it this way or that way. In policing we often look at training as an event driven, instructor centered delivery of information designed to tell people what to think. If an instructor did not teach tell you what to do, well, then you were not trained. This leads to a fixed mindset of, "If we do it the way they told us...we will be ok." I am not saying there is never a time to use PowerPoint based lectures or briefings, there are. However, they are best, when they are used as a tool to facilitate thinking and learning which goes way beyond reading a slide deck. Facilitation requires we grow in our methods of teaching. We must lead discussions and debate. Experimentation and mistakes that cultivate good judgement, common sense and develop adaptability, must be allowed for. This is nothing new and our history is ripe with facilitation, we just need to make the effort and use it. Facilitation of learning is the key to developing a growth mindset. The tactics we use in our programs of instruction must ensure student cops are engaged in thinking about the content. We must influence students to take ownership of their learning and development and we do this through facilitation. A facilitator of learning, therefore, is a teacher who does not operate under the traditional concept of teaching, but rather is meant to guide and assist students in learning for themselves - picking apart ideas, forming their own thoughts about them, and owning material through self-exploration and dialogue. "Facilitating means to get the most out of your students. It means to guide them to the answer without giving it to them. It means they take ownership of the learning, which means your classes become fun to them because they are part of the learning, and not the norm for most classes, which is top down and being lectured at, and then expected to do rote memorization for a test that after they take it, they dump 90 percent of the information." Preparation on behalf of the facilitator is key. You have to know your stuff and have confidence in your ability to engage student cops and influence or relate what's being taught to their own knowledge and experience, so they can actually apply it to the street. Knowing something is one thing. Doing something in context is quite another. Facilitation is a holistic approach to the planning, preparation, execution, and assessment of training that goes beyond task proficiency and incorporates a focus on developing critical attributes in Soldiers and Leaders by emphasizing the “why” behind actions and the consequences of decisions within a wider context. It takes training, how to do, merges it with education, how to think to develop the ability to adapt based on new circumstances. That our students become confident with Mission Command Leader Program and Education principles and how to implement them immediately to develop students into leaders who practice Mission Command. They are Introduced to an array of tools to assist in developing adaptability, which is an evolving process. The all must Demonstrate a proficiency in the art of facilitation while conducting decision-making exercises, tactical decision exercises, and effective AARs. All students are Introduced to and become familiar with the tools of wargaming, tactical decision games, free play force-on-force exercises, and adaptive leader physical training. The also become familiar with how to produce outcomes and measures of effectiveness (assessments) to judge student learning. While learning these methods they are also encouraged to experiment with new ways to develop adaptability and their own leadership and teaching styles as they develop their people. What we trainers must consider is other methods that foster engagement of student cops that build confidence in their understanding of police problems, how to frame and solve them. This takes a variety of training methods. This is exactly what the Mission Command Leader Program instills and what police programs of instruction must shift from training to learning. Receiving New Content — When applicable, use videos, audio clips, presentations and physical manipulatives, such as Legos, blocks, post-it notes, critical question maps, matchbox car sets, terrain maps, pen and paper, table exercises, and tactical decision games and other learning activities in your lessons. Learning stations can help you deliver this content in a single class. Processing Their Learning — Instead of always working individually, give students chances to work in pairs and groups. Working together allows them to reason through problems as they grasp the fundamental ideas in context of the program of instruction. What Carol Dweck is saying is to reach our training and development outcomes and how we measure effectiveness takes more than telling students what to think and do and instead let them process the new information and their learning through desirable difficulties. This done through the art of facilitation. A desirable difficulty is a learning task that requires a considerable but desirable amount of effort, thereby improving long-term performance. The term was first coined by Robert A. Bjork in 1994. Dr. Bjork, UCLA Dean of the School of Psychology and leading learning scientist has well researched and fact-based learning Science, that helps us be intentional and speeds the pace of change. "As the name suggests, desirable difficulties should be both desirable and difficult. Research suggests that while difficult tasks might slow down learning initially, the long term benefits are greater than with easy tasks. However, to be desirable, the tasks must also be accomplishable." Dr. Bjork goes on the say; There are, in fact, certain training conditions that are difficult and appear to impede performance during training but that yield greater long-term benefits than their easier training counterparts. In short when I comes to police training and education, let the student figure out the problem, Yes it takes more time but the experiential learning that takes place, builds confidence in the students ability and what they learn lasts much, longer than making it easy to learn by telling the student what to do. In order to foster engagement and freedom of thought, scenarios or activities must have a significant amount of ambiguity. The situation must be such that one could reasonably interpret the available information in multiple ways. Of course, this does not preclude the existence of wrong answers. In short conditions of instruction that make performance improve rapidly often fail to support long-term retention and transfer in context, whereas conditions of instruction that create difficulties for the learner, slowing the rate of learning often optimize long-term retention and transfer in context. Police officers must learn to deal with uncertainty, and rapidly changing conditions. How we prepare them is crucial in ensuring this. Those who teach police must move from a lecture “top down” centric learning environment to facilitated peer-to-peer and discovery learning where students take ownership of learning using one of several tools they are exposed too as they partake in training and education. First and foremost, did the officer make a decision? And was it timely? If so, did the officer effectively communicate it to officers? Was the decision made in support of the commander’s intent (long-term contract), and mission (short-term contract)? If not, was the officer’s solution based on changing conditions that made it a viable decision, even if it violated the original mission order, but nevertheless supported the commander’s intent? Your varied teaching methods will encourage your students to consider multiple options for achieving their goals, which promotes a growth mindset. A learning culture brought about through facilitation is about continuous improvement that achieves the outcomes training and education seek. These outcomes measured in tangible and intangible ways in context with the actual circumstances that take place, the decisions made and the rational behind those decisions. This is quite different than training that offers a school solution, policy and procedure, checklist or standard operating procedures to a list of problems that may be encountered. Instead a learning culture understands policies and procedures must be written in such a way that specifics are left to the cops on the street facing the problem, a bottoms up approach whose vast experience and education will allow him to pick the right solution for the right situation (mutual trust is crucial here). Currently, police training centers on teaching specific techniques or habits so they can be repeated in a consistent manner regardless of conditions. This type of training "has you picking a school solution in order of preference, like ice-cream flavors on a menu. This is a dangerous path as it creates inward mindsets that focus solely on the skill sets taught, instead of cultivating an outward mindset that requires, sense-making, problem solving, adaptability, meta-cognition and attention control necessary to frame and solve problems. Today when it comes to learning, policing must think in quantum, rather than Newtonian terms. In a training culture, the training and development function is centralized. The training department controls the resources for learning. Employees and their managers assume that if new competencies are needed, they can rely on this centralized function. In a learning culture, learning is decentralized. The entire organization is engaged in facilitating and supporting learning, in and outside the workplace. In a training culture, departmental units in the organization compete for information. Each unit wants to know more and control more than the other units. This competition can result in short-term gains for those units and even for the organization as a whole. In a learning culture, knowledge and skills are shared freely among units. Everyone is working to help everyone else learn from the successes and failures across the organization. This creates a more sustainable and adaptable organization. Officers can only gain the ability to execute this new philosophy with training, experience and education, stressing learning, not only in the classroom or on the range but also day to day, on every call. If we want to improve decision making, adaptability and other core competencies, then we must change the way police learn from the current linear process driven approach. Learning is wholeheartedly about developing people and to develop people we must take advantage of every opportunity to make problem solving and sound decision making as fluid and effective as we can. Doing more facilitation of learning teaches police how to think and do verses rote lecture that tells them what to do. Here are six mindset shifts Gary Klein writes about, that should help trainers and coaches improve cognitive skills. From criticism to curiosity. The belief in question is that the job of the trainer is to spot mistakes and correct them right away. Too many trainers are just annoyed by mistakes rather than seeing them as opportunities. These trainers interpret mistakes as signs that the trainee wasn’t paying attention, or didn’t care, or maybe that the trainer did a poor job. In any event, with the criticism-oriented mindset, mistakes are blemishes. However, the curiosity-oriented mindset views mistakes as opportunities. If the trainer adopts a curiosity-oriented mindset, he/she can hopefully figure out what is confusing the trainee and help to clarify the trainee’s thinking. Trainers should be seeking to harvest mistakes not avoid them or make trainees feel guilty about making them. From following procedures to gaining tacit knowledge. The belief in question is that virtually all jobs can be boiled down to procedures and steps and the job of the trainer is to teach these steps. While procedures are important and necessary, they aren’t sufficient. Expertise is not a matter of following steps. Just about all challenging tasks have too many contingencies and possibilities to be handled by procedures. Expertise is about what we do when the procedures don’t clearly apply — when we have to use our judgment. Expertise is about gaining tacit knowledge — knowledge that can’t be captured by procedures and steps. Tacit knowledge includes noticing subtle cues, seeing patterns, spotting anomalies, and using our mental models of how things work and how they don’t work. Trainees want to buy into the procedures belief — they want to take refuge in learning more and more procedures, adding them to their toolbox, trusting that procedures will take care of just about any problem they might face. The trainer has to help the trainee get beyond this procedural mindset and move onto the path to expertise. From getting through the material to encouraging curiosity. The belief in question is that most of what the trainee needs to learn is in the PowerPoints and lecture material. Therefore, the trainer has to make sure he/she gets through all this material. Class discussions and questions just chew up time and get in the way of covering the material. As a result, trainers often unwittingly block curiosity on the part of the trainees. They squash curiosity in a few ways (I am indebted to Ed Noble at Nova Chemicals for these observations): They discourage questions. They use ridicule, even with facial expressions, to make trainees afraid of looking dumb. They overwhelm the trainees with details. They introduce so much complexity so early that the trainee stops being curious and retreats into a passive stance of desperately trying to remember most of the material being shotgunned. While there are no easy ways to foster trainees’ curiosity, you can see that there are many ways to stifle curiosity. Good trainers have learned to control their tendencies that diminish the curiosity of their students. From providing thorough explanations to providing focused explanations. The belief in question is that the trainer should be lecturing trainees with all the details and contingencies that might come up. As we saw in the previous paragraph, excessive details and complexity can stifle curiosity. Good trainers have mastered the skill of diagnosing the reasons why trainees are confused or surprised. Instead of spewing a canned lecture the good trainers can diagnose why the trainee is surprised — what belief has been violated, what assumption has been called into question. Then the good trainers can speak directly to that belief, that part of the trainee’s mental model that needs adjustment. The trainers are asking themselves, “What assumption are these trainees making that is hanging them up?” Good trainers can provide a focused explanation instead of a comprehensive one. From explaining to discovering. The belief in question is that the job of the trainer is to explain things. Often that is the case but trainees learn more when they discover things for themselves. The challenge for trainers and coaches is to craft exercises and experiences that enable discoveries. That is much harder than just offering an explanation. From evaluating to training. The belief in question is that during the training period the trainers should assess which trainees are struggling and should be dropped from the program — the trainers can save everyone a lot of effort by culling those who aren’t a good fit. The problem with this approach is that it severely interferes with training, as I explained in an earlier essay. If I know you are watching me to see if I measure up, I am going to be super defensive and guarded during training. I am going to be careful not to get caught doing anything stupid. I am NOT going to be exploring different strategies. I am NOT going to be eager to get feedback on what I did wrong. If I do get critical feedback I am going to try to make excuses rather than take it in. By combining training with personnel evaluation, organizations interfere with the training process. We can and must do better in how we develop our cops. Gary Klein has laid out 6 great ideas to helps us evolve our mindsets from a training culture to a learning culture. We must as instructors (teachers) learn how to facilitate learning so those we teach develop the abilities to frame and solve problems, in todays complex world. To policing, the purpose of learning is to create the most effective police officers we can. My hope is this post gets you thinking about how to do, just that. Ultimately when it comes to developing our people, we are only limited by our imagination.